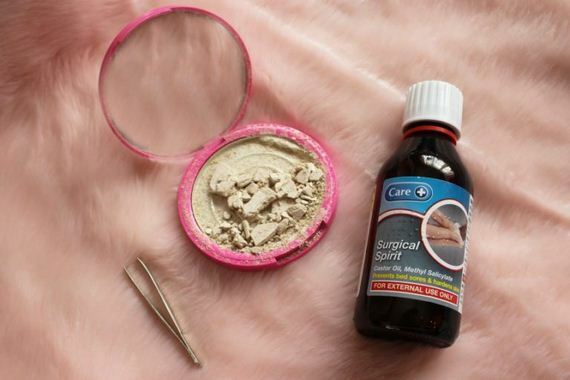 There are actually a number of ways that you can fix broken makeup yourself in order to save your products from the doom of being thrown out and when they don’t have to be. 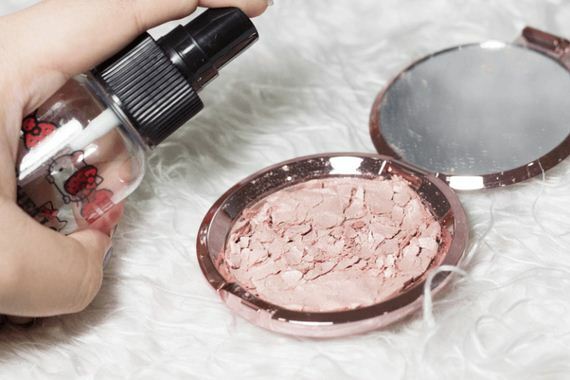 Check out these 15 different methods and techniques for fixing broken makeup of all kinds in order to save them from being wasted! 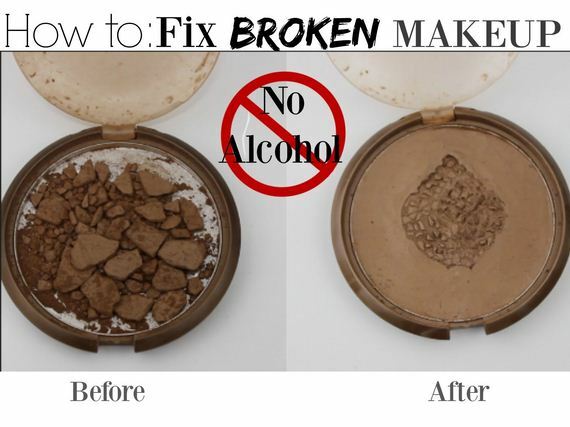 When you Google search “fix broken makeup”, you’ll find that the most common thing that pops up is powdered, since those break so easily. Sometimes, however, lipsticks snap and need to be saved too! Makeup Tutorials suggests harvesting what’s left, mixing it into a gloss, and re-potting it so it can be put on with a brush instead. 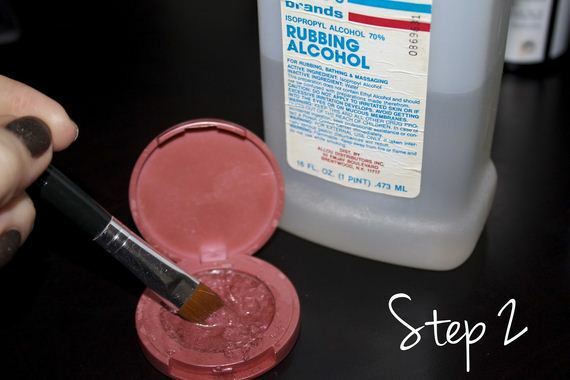 As you’ll notice, many of the techniques and tutorials you’ll find online for fixing broken powdered makeup involve soaking it in isopropyl rubbing alcohol and letting it dissolve out, leaving the powder once more packed down and smoothed. 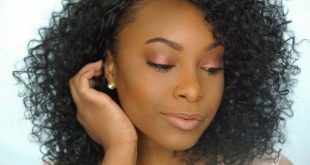 There are many different spins on this technique, but the basic steps that you see on Girl Versus Makeup are perhaps the most popularly used. While some tutorials suggest taking the powder right out of the original pot and mixing it elsewhere, Ms Quinn Face opts to skip that step and just make the whole process happen right in the compact to save materials and time. That way you can just press things down, leave it all to dry, and be done with it! Are you worried about over-saturating the compact, not smoothing it out properly, and ending up with a lumpy finished product that you don’t like using? Then check out how Happy Treasures changed the standard process up ever so slightly! They place the compact on an old plate to catch any mess, use the cap of the alcohol to add it in smaller quantities, and use the flat back of a spoon to smooth things out nicely and really press the powder down. Perhaps your compact is actually only crumbled a little on the very surface but not at the bottom, so you don’t know that soaking all of what’s left in a lot of alcohol will really be helpful without doing more damage? Then use a spray bottle of alcohol instead! Beauty Nerd by Night shows you how to spritz the surface of the compact more lightly for things that are only damaged a little bit. Are you unable to find actual 99% proof isopropyl alochol in your local drug store? That’s certainly a possibility, as some countries have actually outlawed its sale to the general public. 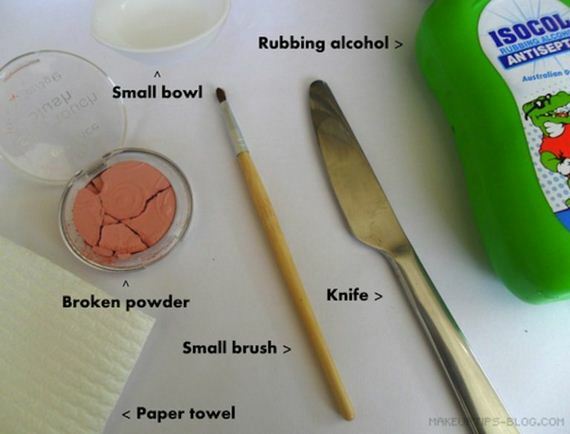 Instead, check out how Alice Jane Potter fixed a smashed highlighter using tweezers and surgical spirit. 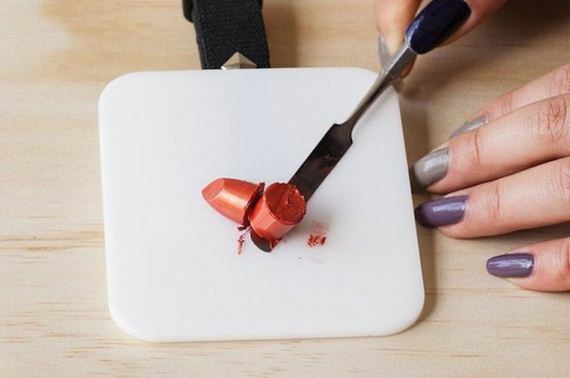 Makeup Tutorials guides you through the process of saving a broken lipstick by using a lighter to actually reattach the broken piece to the base. If you’re very careful, this one can be done almost seamlessly, making the fixed lipstick good as new! 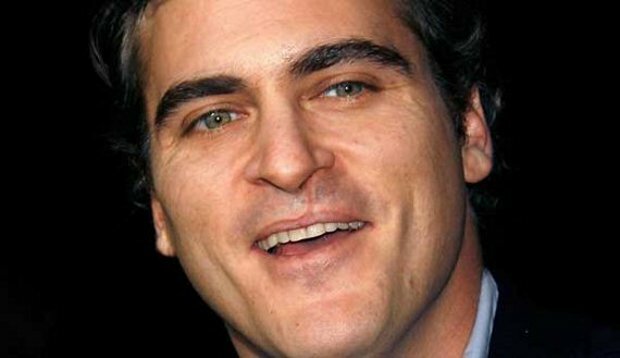 Just be careful not to burn yourself. Are you you intent on fixing your latest smashed palette as well as you can but you have very sensitive skin and don’t want to use alcohol, since it’s proven to dry things out? 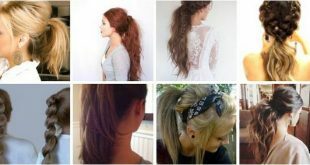 Then you need to see this alternative tutorial from Golden Poise! 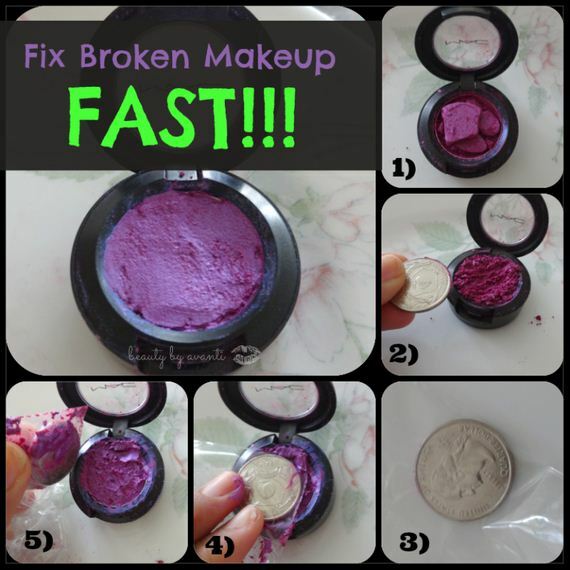 They show you how to fix it using a makeup primer that’s already sitting in your makeup kit instead! 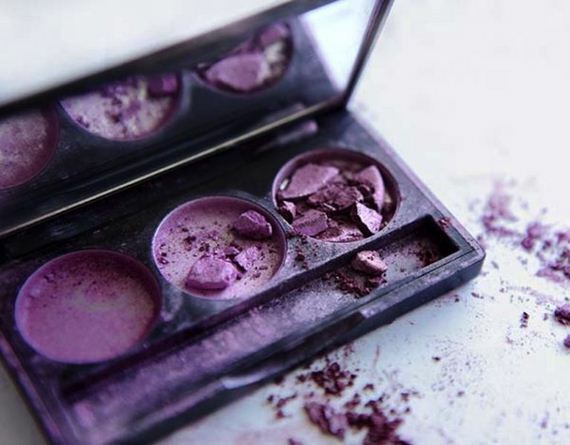 Do you have an old eye shadow or shadow palette that’s so broken and used that it’s basically just remnants at this point, but it’s your favourite and you’re intent on using every last little piece of it? Then Crafting a Green World has just the tutorial for you! 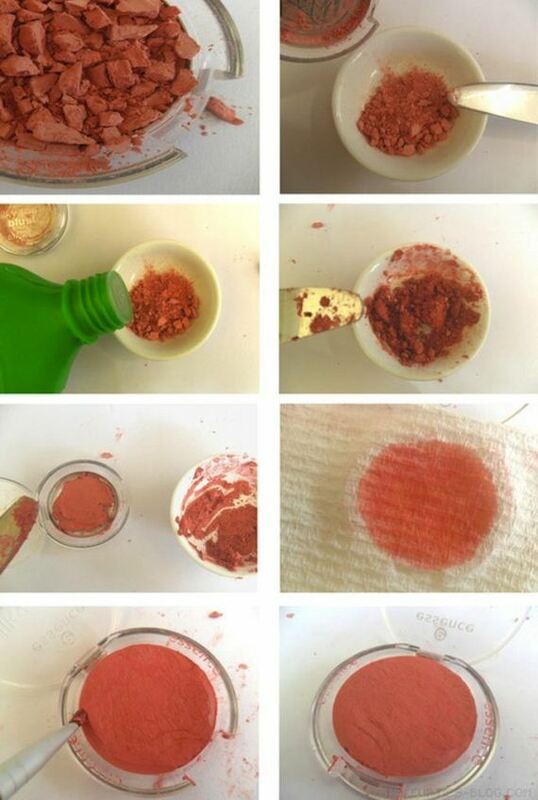 Check out how they turned what’s left of the smashed powder into a cream shadow by mixing it with coconut oil. 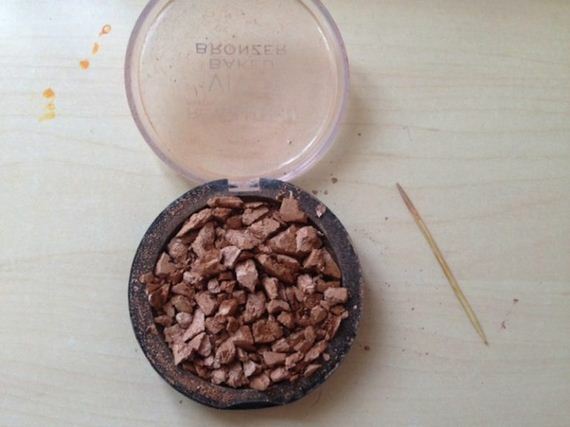 Are you trying to fix an individual eye shadow that comes in its own standard sized pot, but you want to press it down nice and evenly to decrease its likelihood of smashing again later? 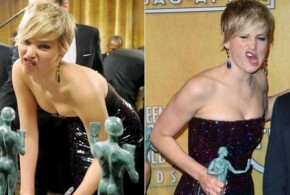 Then, for most brands, you can do this with a coin! Beauty by Avanti suggests using a quarter over top of some plastic wrap because they’re the perfect size. Do you have a deep love for cream eye shadows but you’ve been holding onto your favourite shade just a little too long from trying to use it sparingly and now it’s begun to dry out, crack, or pull away from the edges of the pot? When this happens to us, we find that it gets less creamy and we like the texture less. 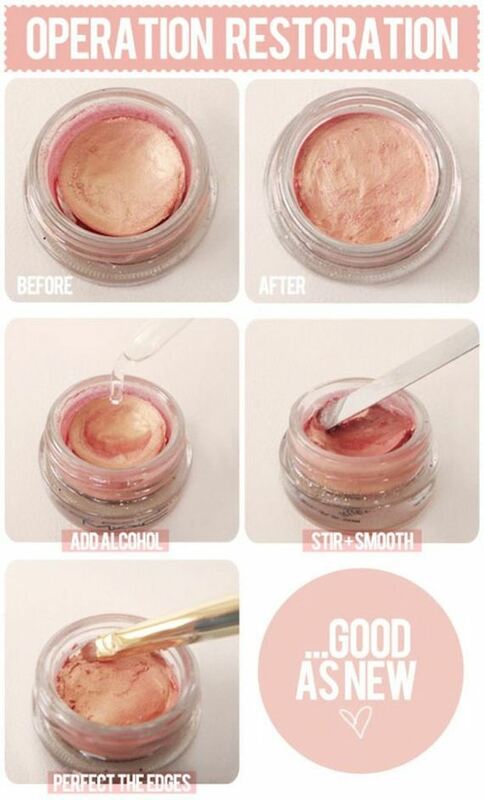 Save your cream shadows from the same fate by re-mixing them using alcohol, just like The Beauty Department did here. Is the powder you’ve broken so smashed that it’s almost dust but the pot that it comes in is very shallow and not great for mixing in without making a mess and losing most of the product? 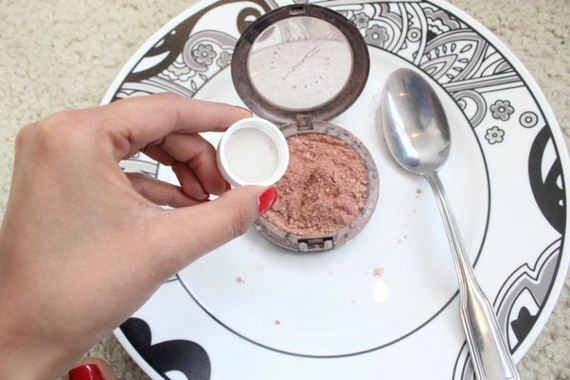 Then try de-potting all of the powder entirely, mixing it smooth in another container, and putting it back into the original compact to smooth the pot out again, just like Makeup Tips did here. Do you have experience fixing your own makeup compacts but you’re always a little disappointed in the end because they no longer have the pretty logo or design on the top that they once had? 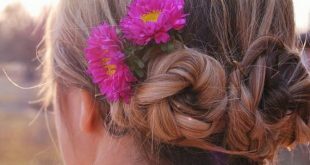 Well, avoid that plain, just-fixed look in the future by adding a new simple design on the top as you re-pot the makeup instead! Emily Eva Alice shows you how to create a series of pretty little dots using textured paper towel pressed into the powder when it’s still damp with alcohol. Are you willing to try the standard alcohol technique but you’ve found that you don’t currently have any of the smoothing, mixing, or potting tools that the tutorials we’ve shown you so far suggest using? 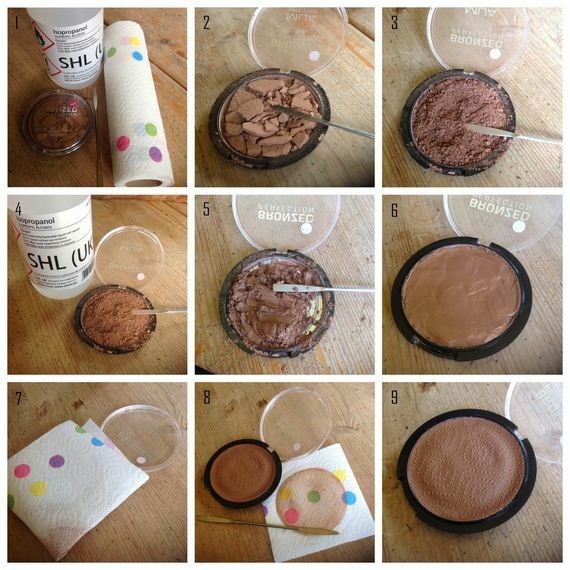 Well, just for the sake of having many options and enough alternatives to get your project done, here’s one from Makeup Tips that shows you how to do it all with a paint brush and a butter knife! 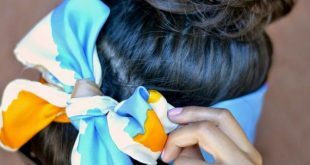 Perhaps you’ve been scrolling through this list thinking the entire time about how much of a mess most of these techniques will make and trying to think of ways to minimize that when you try it yourself? 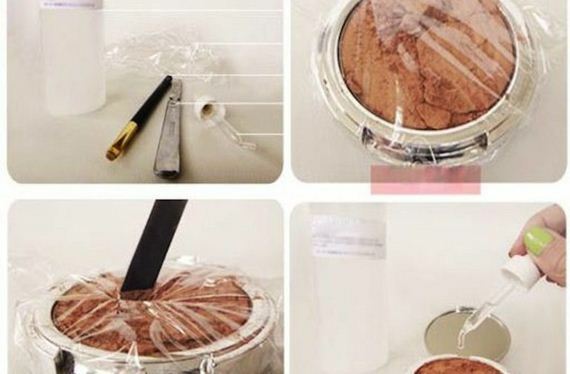 Then we think you’ll quite enjoy Beauty Zone idea for basically encasing the whole original compact in plastic wrap and packing and smoothing the makeup down over that to keep stray powder and makeup chunks contained!